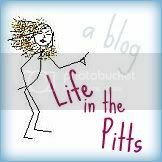 Life in the Pitts: I'm kind of mad. At myself. And that doctor. Wow! I sure hope everything is okay! That's crazy that you brought up Tampax Pearl! I had a problem with that brand about a year ago as well and as soon as I quite using them, I haven't had a problem since! It's great to let other know about this! I think I'd be scared to see my medical records. I'll pass! I had a 5 POUND yes....FIVE POUND fibroid tumor removed from my uterus 7 years ago. IT and all it's grossness is in my file for all the world to see. My husband calls it the "ham" but it wasn't just your average tumor either and it is THE reason Alice was so hard to obtain and why she is extra extra extra special too! Dr#1 wanted to take out ALL my parts. Dr's #2 and #3 painstakingly removed only the tumor leaving me and very scared but intact uterus. 5 years and many meds, treatments, 1 more surgery, shots, procedures.....we have an ALICE MARIE!! :) BUT I feel your pain! I DO!! i'm running home tonight and throwing out every single tampax pearl i own (and I own a lot...as in the 50 piece box, yo). Hope everything is ok! I'm going to ask to get my medical records now...I'm beyond curious! I was creepy-sick in college once too. Hope the new doc works out for you!!!! Oh my gosh Helena...thats horrible. I'm glad you're okay now but seriously...what a sucky thing to do as a doctor! However, maybe now your story can save other girls from going through what you did because I'm soooo never going to use Tampax pearl again! They will write every single thing you say to them down. When my son was younger and really sick(I was up all night long with him) I said to my doctor, this kid is really sick. They wrote that down, and made a snide remark about it in his file. I snooped through it one day a couple of years ago and saw it. I now don't say anything to them, I don't have to. eesh, I don't like that. I've only used the pearl tampons once, but I won't ever again because... yeah. I hope you like your new doctor! a) agreed never pearls again. UH Nah Dude,, I'm not depressed I've been vomiting for a few days now and its all starting to blur and I would like you to make it stop so I thought I would bring you info to HELP me...dummy.!!! Okay, I'm choking on a laugh at the "and this person, and this person....." and- "don't use tampax pearl. trust me on this one"..